In other words, how you will use VoIP to make an internet call to Mumbai depends on the specific VoIP provider and type of VoIP service you choose. On this page, we try to recap the main approaches for making an internet call using VoIP, but you will need to check directly with your VoIP provider for specifics. 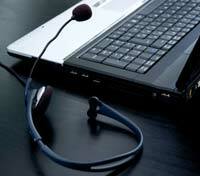 In general, there are four ways to make international VoIP internet calls to Mumbai. To use this type of VoIP service, you dial a local access number or toll-free access number that connects you into your VoIP provider's network. Then you dial your account number and PIN and your destination phone number in Mumbai, and your call will be connected. You can use this kind of VoIP service to call Mumbai from any landline or mobile phone, including payphones. To use it, you go to your VoIP provider's website and enter your phone number and the Mumbai phone number you are calling (the 'originating' and 'destination' numbers, respectively). These can be either landline or mobile phones. Then you click 'dial' (or similar) and the VoIP provider takes over by dialing both numbers independently from within their system causing both phones to ring at roughly the same time. Once you and your Mumbai party both answer your phones, the connection is made and you begin talking as normal. To use this type of service to make an internet call to a Mumbai landline or mobile phone, you would dial the destination Mumbai telephone number as you would from a regular phone. The call will be automatically routed over a VoIP network to Mumbai via your internet connection. Once in place, you don't need to dial access codes or PINs, but you do usually need to designate which calls you want to go via VoIP vs. your regular landline phone provider. Unless you experience call quality issues*, your Mumbai party won't know that you are using VoIP. You download and install the VoIP software program from your VoIP provider's website. Then, you create an address book with the telephone numbers of the people you want to call in Mumbai and elsewhere. Once the software and VoIP headset / phone is set up, you make calls by opening the VoIP dialing program and clicking on the person you want to reach. Your VoIP provider routes the call to Mumbai and your party can answers - either from their computer using the same VoIP service or on their regular landline or mobile phone if you have bought a paid service plan that allows outbound calling to regular phones.